“There’s a saying that I hate. I know it shouldn’t bother me like it does, because its only a saying. Six words. Five of which are one syllable long. I’m sure there are more irritating phrases; in fact I know there are. Charlie Han is the Chinese kid from the chippy. That’s pretty much how people know him, other than being the clumsy idiot who ruins things and who only has one friend, Sinus AKA the kid who stares at walls. Charlie is tiny and he hates that stupid saying ‘good things come in small packages’ but he knows something. He knows that everyone is good at something. He just needs to find out his something but with a mum who wont let him do anything and a dad who just agrees with her all the times its taken a long time to find out what that is. However now he has found his gift, and it just had to be one of the most dangerous things he could find. Keeping his hobby of skateboarding away from his mum should be hard, but it would seem that he’s not the only one keeping secrets, and its hard to stay on the board when your whole world is turned upside down. What an incredible book. From the very beginning the brilliantly worded Charlie had me hooked with his wit, humour and fight. I could tell I was going to love him and battle his corner for the whole book from the very first page and I was so right. So Charlie really isn’t in a good place when we meet him. He’s just crushed the school play scenery and been humiliated once again. He knows what the problem is but can’t see to do anything about his height and his clumsiness. The story unfolds so we learn that his mother practically has him wrapped up in cotton wool and he’s not allowed any real freedom. Its no wonder he rebels by learning to skate – I would too. As we find out more about Charlie and his family it becomes apparent that his secrets aren’t the only ones flying around and I loved where the story went with his parents and Dora. I think what I enjoyed most about this book was that the characters felt real. Charlie had the attitude I would expect of a 14 year old boy, especially one that gets ridiculed on a daily basis, not to mention being mistaken for a child a lot of the time. I also loved Sinus and their friendship because in all honesty I know that in real life we do just end up with people sometimes, and occasionally its those friendship thats just happen that become our best. Sinus was brilliant as a character too and I loved his personality. He was a little offish at first but soon I learnt that there was more to him and a lot to love too! The one thing that really stood out with this book was the excellent balance of humour and seriousness. There are some truly awful things in The Bubble Wrap Boy and they got me angry, made me sad and made me appreciate what I’ve got. However in amongst all that there was humour, a laid back attitude towards things that could easily get blown out of proportion and some brilliant relationships. I loved Charlie’s time spent in the sun with one particular character, who I wont mention for fear of spoilers, and even though occasionally they were some of the saddest parts of the book they made me happy because I knew that at that point the characters were happy too. 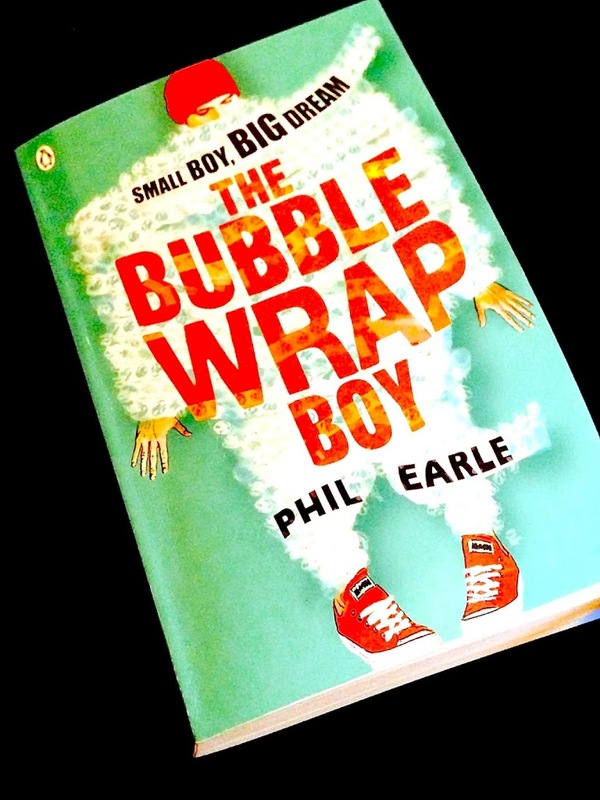 I think Phil Earle is a really great author in the way that he just gets his target audience. Both this and Being Billy reminded me of being a teenager again and I think a lot of kids will relate so well to his books. I am sad I haven’t got round to Heroic and Saving Daisy yet, they are definitely on my to read soon list!